Apple has launched its iPhone 5s and iPhone 5c sales in Canada, with customers at its Halifax retail location getting their first hands on its newest iPhones, such as Cole McLean, first in line since 10PM local time to purchase a gold iPhone 5s. The Apple Store at Halifax Shopping Centre just opened at 8AM local time. He ended up buying a 64GB gold iPhone 5s at 8:14AM local time, one of the first units sold in Canada. At 12:01AM PDT, Apple kicked off online sales of the iPhone 5s in Canada and the USA. 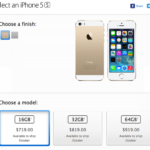 Gold iPhone 5s models all sold out in less than 10 minutes. Today, expect Rogers, TELUS and Bell to start taking iPhone 5s orders, but from what we’ve been hearing, there will be severe supply constraints. Like we said before, use the free app TalkTo to reach out to as many carrier stores and dealers to see what stock will be. Everything you need to know about today’s iPhone 5s/5c launch is right here. Good luck!